For homeowners around the world, the idea of reducing their power bills and helping the planet is pretty enticing. The problem now as it always has been is money. Solar can be expensive, and even with government rebates the cost can scare some people away. If you are a do-it-yourselfer you've probably wondered if you can tackle a solar project. Let's walk through a typical design and installation process and see if its right for you and your home. A Solar Pathfinder makes site selection a snap. Well you're probably smart enough to figure out that you'll need A) a sunny region and B) a sunny place to install the system. The more sun you get, the quicker your systems will pay for itself, its that simple. There are some nice tools to determine where exactly you should put the system. The solar pathfinder is one of easiest and most affordable ways to find the best location for panels. 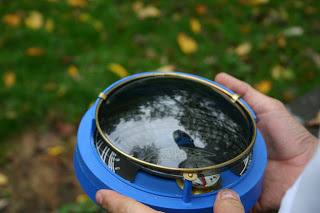 This ingenious device works by showing you a reflection of the sky and the sun's path for all four seasons in your area. Using this you can see exactly what will shade your panels throughout the course of the year. You also want solar panels installed fairly close to your home and power meter. Since photovoltaic power is DC, the wire that carries it grows larger and more expensive the further away it is from the inverter, meter, and power center of the house. You'll want a place close to the house but out of way of children and their errant soccer balls. Also if you are planning on installing the system on your roof, its worth it to do a roof inspection. No sense in installing a system if it will have to be removed in a couple years to replace the shingles. Generally speaking the closer you can get your panels to facing due south (or 180 degrees azimuth) the better. If you live in an urban area and are not sure which way south is exactly, use Google Maps to look up your address and click on the satellite image. You might be surprised to see that roof you thought was south facing is actually southeast facing! The angle from horizontal is very important too. The angle should be equal to your latitude since this will mean the panels will be perpendicular to the sun for greatest amount of time. If you're not sure what latitude you're at, check out this latitude map of the US. So if you live in Portland, with a latitude of approximately 45 degrees, your panels should be set at an angle of 45 degrees from horizontal. IF your roof angle is within 10 degrees of you latitude you can mount the panels easily, if not you may have to consider a rack system that will tilt the panels. The rule of 1/10 is easy to remember for solar power. You'll need 1/10 of a square foot for every watt you install. So if you want to install 2,000 watts, you will need about 200 square feet of space for panels, racking, wiring, and a little space to work around them. This will vary slightly by the type of installation and panels you get but this will serve as a guide for the time being. You'll also need about a 4'x4' area near the meter for the inverter, breakers, and power components. Keep in mind also that your power company may want to install a new meter or even an additional meter for the system. Its always a good idea to talk to your power company about installing a system. You will probably need an interconnection agreement, an inspection, and a rate schedule if you are planning to sell back power. They'll also want some information about the panels and inverter you are installing. Also, ask about additional rebates and an up to date cost per kilowatt-hour that you are paying. You should also place a call to the local building department and ask about permits. This may seem like a pain, but really it protects you from hassles in the end. Eventually they'll probably find out about your systems anyway and you may have to pay a fine for not getting a permit. The vast majority of inspectors will allow you to install a system on your own home, they may just require you to have a master electrician sign off on the installation. you'll want to decide just what the system is going to produce over the course of a year. The National Renewable Energy Lab has a cool tool that will allow you to do this. With the information you've determined in the steps above, click on this solar map. Then find your area, and double click on it. You should see a data window open up with a link at the bottom that says 'Send to PV Watts'. Click on that link, then enter the information we determined in the first steps for angle, azimuth, and cost of power. Also enter the size of the system you want in kilowatts. Click on the calculate button and you'll see the production per month for a year. This can help you determine payback. Possibly the most important part is deciding how much you can spend on a system. Most complete solar power kits cost between $4 and $6 per watt, depending on the size and racking system. Be sure to take into account all state, local, and utility incentive programs, which can be found here. You may even find a supplier that will take the rebates off the price of the system, then the manufacturer goes after the rebate. Sharp has a program like this. Next we'll determine what skills and tools are needed, and start planning the installation. Kriss Bergethon is a writer and solar professional from Colorado, for more information visit Solar Garden Lights.